Blue Ridge Real Estate is committed to providing personable and knowledgeable service to its clients. Likewise, we believe in providing the same service to our agents. We are looking to add only a handful of agents to our team. We have no ambitions of growing so large that we forget that the experience is about our clients, and our agents. We are wanting to add agents with high ethical standards, who care about their clients, and enjoy being in charge of their own business. Whether an agent is a newly licensed Provisional Broker, or has a number of years of experience, we believe in a work environment that fosters a positive and supportive atmosphere. No drama, no selfishness, and no negativity. Our commission split is aggressive and offers opportunity for growth and success for both new and experienced agents. We want to reward your success, and we prove it by offering one of the most aggressive splits in town. Not only will our commission splits be aggressive, but Blue Ridge Real Estate will NOT be charging their agents things like Transaction Fees, Broker fees, Franchise fees, etc. ➡ Contact us today if you are interested in learning more. 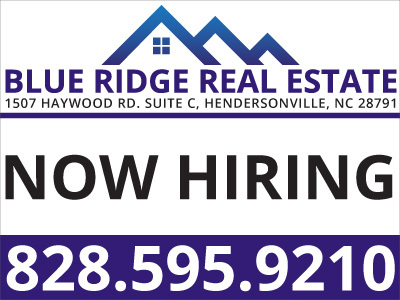 We can schedule a confidential meeting to discuss the opportunities available at Blue Ridge Real Estate.